MachineartMoto focuses on specialized components for the BMW R1200R, R1200GS and GS Adventure and the F650 and F800 GS models with fitments for both standard and ESA equipped BMW's. The products, which are marketed under the "MachineartMoto" or "mamo" logo, include the X-head Engine Guard, the MudSling Rear Fender, the Slipscreen Sport Flyscreen and the Avant 12 Front Fender Extender. 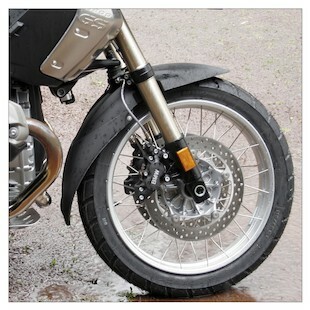 The MachineartMoto Mudsling protects your suspension from mud, tar, rocks & reduces clean-up. Precision molded from high impact ABS plastic, the MudSling is typically finished in matte black or matte metallic black. It is very light and somewhat flexible, but once mounted it is an absolutely solid component that integrates perfectly. The MudSling mounts in less than 10 minutes with included hardware and the only tool needed is a T25 Torx driver, which comes standard in many BMW OEM tool kits located under the seat. Once mounted, the stock shock protector can be removed to show off the entire shock spring. MachineartMoto MudSlingMAX is reshaped to provide 12% more coverage compared with our former model and fits all suspensions - stock, aftermarket, and ESA. It is also shaped to fit all OEM & most aftermarket side cases mounts. The MachineartMoto Avant 12 adds front fender length for superior mud, tar, & rock splash back control without having to drill holes in your fender to mount it. It's easy to install with 3 Avant screw mounts that securely grip the underside of the fender. Injection molded in a resilient plastic resin, it exactly matches the texture of the stock fender, & the angled wings provide wide coverage without looking wide. Also available as the MachineartMoto Avant 8.6 for smaller BMW bikes. The MachineartMoto X-Head DOHC is designed to cover more of the cylinder head than other guards to protect the center during a fall. Even in a driveway drop, the force of inertia causes a roll onto the face of the cover before the bike settles onto the cylinder's edge. Between the tough nylon shell and head is a thick rubber liner that helps absorb impact force. Also available as the MachineartMoto X-Head v3 for 2005-2009 R1200 hexhead models and 2010 R1200R, GS, RT, R, ST, MegaMoto, and HP-2. Included are stainless steel bolts with Nyloc threadlock patches so they stay tight. X-Head DOHC protects while letting just enough of the new head shape to show through. Fits with the following crash bars: BMW OEM; Adventure Designs BMW crash bar extensions; Touratech; Hepco Becker; SW Motech. Does not fit Z-Tecknik bars. 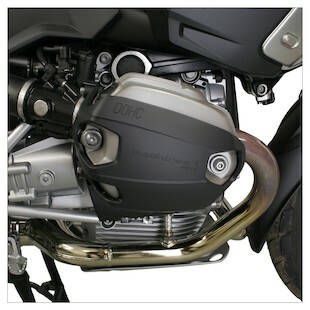 The rule of thumb is: if your bars fit with BMW's OEM cylinder guards, they will fit with X-Head DOHC. The MachineartMoto Slipscreen is designed for riders who are annoyed by wind noise and buffeting of the stock GS screen and want a stylish, comfortable alternative for dirt riding and warm weather. Slipscreen is the solution that is short enough not to upset air flow at helmet level reducing noise, while creating a pocket of still air up to chest level for comfort. Made in 4mm high impact ABS, it is finished in satin black metallic, and mounts with the stock hardware to retain adjustability.